Welcome to my Pastel Pet Portraits website. 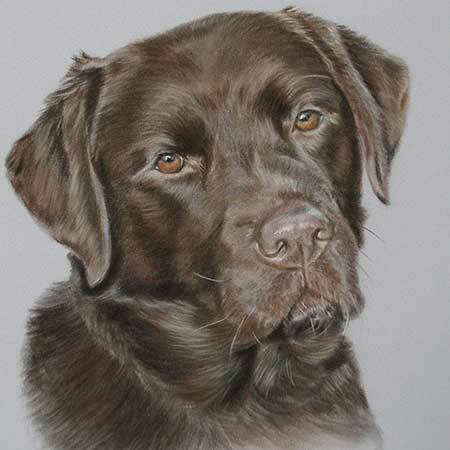 I’m a UK based animal portrait artist who paints dog portraits, cat portraits and horse portraits in a range of sizes. My pet portraits are available in both pastels and oils. This website gives information about my prices and also shows examples of some previous pet portrait commissions. To see more examples of some of the pets I have painted in the past visit my Facebook or Instagram pages. Prices quoted are unframed but I can recommend a range of frames and supply framed if required. Should you have any questions about my services please contact me. I’m Lorraine Gray and I have been a professional animal portrait artist for over 20 years. I have been delighting clients worldwide with commissioned paintings of their beloved pets from their photos. In 2007 I appeared on BBC1 Television at Battersea Dogs Home. I am also an author of three books on how to paint pet portraits in oils. Many of my commissioned pet portraits are from people who want a lifelike portrait to remember a recently passed, loved pet. With a good photo to work from and by talking to the owners about their pet’s personality I aim to bring their pet to life in my painting. I also get lots of commissions from people wanting to give pet portraits as a gift. Usually this is a Christmas gift or a birthday gift. If you want to commission a pet portrait as a gift please book early. For those times where the decision is last minute you can always buy an animal portrait gift certificate so that the owner can decide on the pose at a later date. Details of my gift certificates can be found on my prices page. Some examples of my work appear on this website. There is also a blog section where you can read about my commissions and view work in progress, finished pet portraits and framed paintings. I’m also active on Facebook and Instagram where you can view my work. My testimonials show that you can be confident that I will provide you with a pet portrait that is lifelike and will bring you many years of cherished memories of your pet or pets. Beautiful & lifelike dog portraits from photos in either pastels or oils. As with all our pet portraits we can supply framed or unframed. Let me capture your cat's personality forever with one of our commissioned cat portraits. Pet portraits make the ideal gift. Pet portraits of horses from a photo. My horse portraits are available in pastel or oils, supplied framed or unframed. Dear Lorraine, thank you with all my heart for doing such a marvellous dog portrait of my beloved Missy. I was expecting something special from you and special does not do justice to that which you have produced. I'm truly thankful. I made contact with Battersea Dogs Home to find out about you, after seeing 'Pavarotti' and you on Television………….. Shortly after our cat Archie died I asked Lorraine to do his portrait. It is so stunning and the perfect reminder of a beloved pet gone too soon. Lorraine worked so hard to get him perfect. I then asked for a dog portrait of our Charlie as a surprise for my husbands birthday which I’m struggling to keep a secret as I keep sneaking a look at it. It’s just so beautiful. Lorraine has a wonderful way of capturing personality beautifully. She’s also the easiest person to contact and chat with, knows how important it is to get it right and is a complete professional. if only everyone was so easy to work with. Lorraine has just completed a horse portrait of our ponies, it is beautiful, brought tears to my eyes when I saw it. An amazing wonderful talent, thank you Lorraine. Most frequent pet portrait questions. Click question to reveal answer. I want to commission you to do a pet portrait. What's the difference between pastels and oils?. Clients often ask me what is the difference between pastels and oils. With both mediums I create my pet portraits by building up layers. Pastels are a dry medium and are built up in several layers. But as it is a dry medium it means I can carry on with my portrait without waiting for each layer to dry. Because Pastels are a dry medium, the paintings need to be framed under glass. I use a mount between the painting and the glass to keep the glass from touching the portrait. Oils are a wet medium; therefore I have to wait for each layer to dry before I can proceed with the next. Oils are very time consuming and the portraits take several weeks to finish. Oils do not need to be framed under glass. The canvas can be hung unframed, or you can have it framed. Neither medium is more superior than the other, both are equal in quality. As with any mediums, if properly taken care of the pet portrait will last for many lifetimes. Which medium is best for my pet? Clients sometimes have trouble choosing which medium to have for the pet portrait. I can guide them when I have seen the photos of their pet, but really it’s down to personal preference. Pastels are a soft medium, which makes fur texture look ‘real’. Oils are a little more vibrant but can look equally as real and lifelike. My waiting list varies depending on time of year. I work on a first come first serve basis. If you have a deadline in mind, let me know as soon a possible and I will be happy to help you. Please note, the nearer it gets to Christmas, the longer the waiting list gets, so book your pet portrait early to avoid leaving it too late! If you are looking to buy an animal portrait as a gift then consider buying one of my pet portrait gift certificates. The owner can then decide which pose they would like and whether they prefer pet portraits in pastels or oils. I know you do pet portraits from photos but how many photos do you need to work from? For my pet portraits I work from one photo. This photo of your dog, cat, horse or any other animal needs to be one that you love and say “this is typically her/him”. Other photos are helpful for colouring and for me to see character, but not necessary if you don’t have them. See my photo guide blog post to help you with taking your photos of your pet or pets. If you are local to me, I can come and take your photos for you! What size portrait will be best for my pet? You can have any pet painted in any of my sizes. For example I have done a horse portrait in the smallest size 10” x 12” and a cat portrait head study in my largest size 20” x 24”! The smallest size would be head study only. If you are unsure which size you would like, send me an email with a photo of your pet or pets and I will gladly guide you to a suitable size (e.g. if you wanted it life-size). Want to commission me to do a painting of your pet? We all love our pets dearly and so it’s only natural that we want to capture their personality in a painting. Why not contact me to enquire how I can give you a pet portrait that you will treasure?